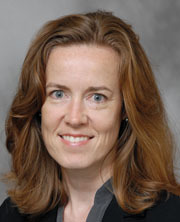 Dr. Sally Mullany joined the gynecologic oncology faculty of the Department of Obstetrics, Gynecology, and Women’s Health on September 1, 2011. Dr. Mullany’s most recent position was as an assistant professor in the Division of Gynecologic Oncology at Wake Forest University Medical Center, Winston-Salem, North Carolina. She completed her fellowship in gynecologic oncology and her residency at the Mayo Clinic in Rochester, Minnesota. Dr. Mullany has received several awards in teaching, professionalism, and research during both her residency and fellowship.In addition, Dr. Mullany is the Director of the Gynecologic Oncology Fellowship Program in the Department of OB/GYN and Women’s Health.